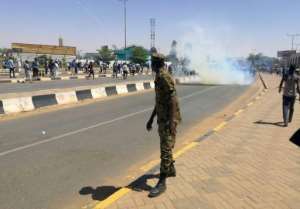 Sudanese police fired tear gas Sunday at thousands of protesters who rallied outside the army headquarters for a second day urging the military to back them in demanding President Omar al-Bashir resign. 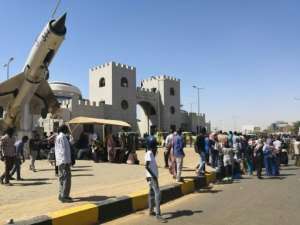 Chanting "Sudan is rising, the army is rising," crowds massed outside the Khartoum complex that also houses Bashir's official residence and the defence ministry, many having spent the night there, witnesses said. "We won't leave this area until he steps down," said demonstrator Osama Ahmed. Bashir chaired a meeting of the security council as protesters continued to chant slogans outside the compound. "The security council confirms that the protesters are part of the Sudanese community and their vision and demands have to be heard," the presidency said in a statement afterwards. "The council will take measures to enhance peace and security across the country." Protesters whistled and waved at military vehicles entering the compound, prompting some soldiers to wave back, a day after demonstrators said they were gathering to ask the army to "come join us". Riot police deployed near the complex Sunday morning, firing tear gas in an unsuccessful attempt to disperse the crowds, a witness told AFP. Protest organisers chose April 6 to begin the rally outside the army headquarters to mark the 1985 uprising that toppled the regime of then president Jaafar Nimeiri. Since the start of the protests, security agents and riot police have cracked down on demonstrators but the army has not intervened. The rally was the biggest since protests erupted on December 19 in the central town of Atbara, quickly spreading to the capital and towns and cities across the country. Witnesses said protesters arrived in cars, buses and on foot to the army complex on Sunday. Many offered afternoon prayers on the road outside the complex, while others raised Sudanese flags over their heads to protect against the afternoon sun. "Overthrow, overthrow," chanted young men and women. Many climbed on roofs of cars and buses flashing the victory sign, onlookers said. "Many people have come with food and water as if they plan to camp here for days," a witness said. Sunday's protests coincided with a nationwide blackout that the electricity ministry blamed on a technical glitch. Outside the army complex, protesters sang nationalist songs, whistling and clapping as they pressed on with the rally. Some protesters blocked a nearby bridge linking Khartoum with the northern Bahari district with rocks causing huge traffic jams, onlookers said. Several private companies declared a holiday at their offices, while some arranged to ferry water, snacks and juice to the protesters, according to witnesses. 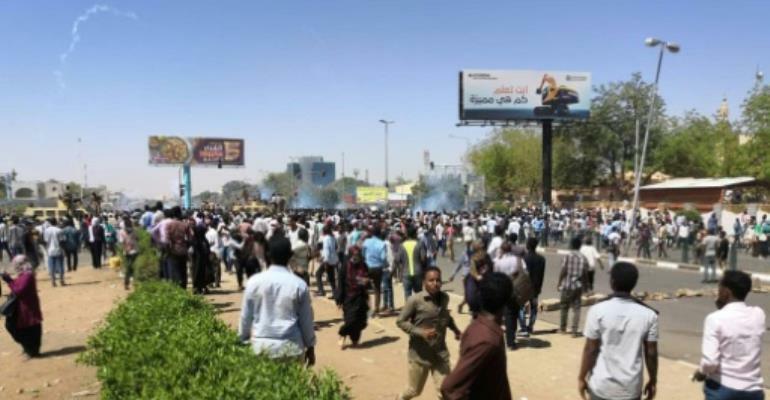 In a separate demonstration on Saturday a protester was killed in Khartoum's twin city of Omdurman, police said. Officials say 32 people have died since protests erupted in the east African country after a government decision to triple the price of bread. Human Rights Watch has put the death toll at 51 including medics and children. 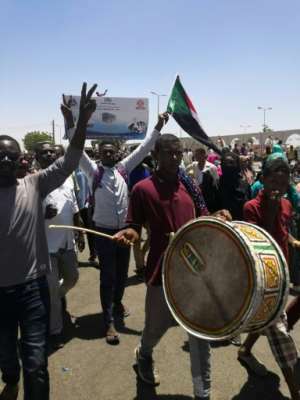 The rallies quickly morphed into protests against Bashir's government, with demonstrators accusing it of mismanaging the economy, leading to soaring food prices and regular shortages of fuel and foreign currency. Bashir has acknowledged that the economic concerns raised by protesters are "legitimate", though he imposed emergency rule on February 22 after an initial crackdown failed to rein in the protests. The scale and intensity of protests have shrunk since the emergency rule went into effect. But with Saturday's rally analysts say the protest movement has gained new momentum. "The scale of protests on Saturday illustrate that Bashir's gamble that he can save his regime through repression is proving to be a losing bet," said Murithi Mutiga of the International Crisis Group.